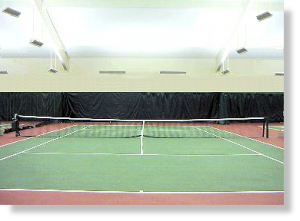 Brite-Court Sports lighting fixtures offer solutions for indoor tennis court lighting and other specialty sports lighting applications. 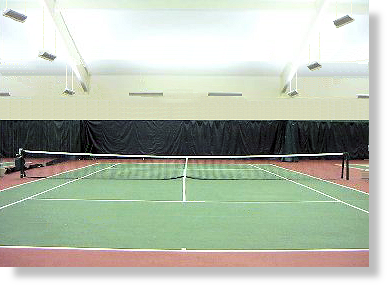 We offer several very distinct tennis lighting options for both new tennis court construction or existing lighting renovation and retrofit, including both Indirect tennis lighting as well as the popular Direct tennis lighting solutions from recreational to tournament light levels and for the most demanding facilities, a ULTRA-PRO combination of a Direct and Indirect tennis lighting into one complete system (the best of both worlds). Our indoor sports lighting products provide the highest levels of performance and energy efficiency using both LED lighting and High Output (HO) T5 Fluorescent technologies. Beyond the product, The Brite-Court design team has provided tennis lighting services for 100′s of courts over the last 12 years from small clubs to Division 1 Universities. Regardless of your location (US and Canada), our tennis lighting fixtures, specialty Sports lighting fixtures and design services can deliver with very competitive cost. Brite-Court lighting systems are extremely energy efficient typically 40%-70%. If you currently have Metal Halide, High Pressure Sodium or older T12 fluorescent tennis court lighting in your facility the energy savings will likely fall within the above range, especially with the lighting management capabilities our lighting systems. The energy savings sounds great, however light quality must be either improved or preserved. Sports lighting especially tennis lighting with fast moving objects require delicate balances of light levels, lighting uniformity, with minimal glare, all three are required to achieve a competitive sports environment and safety for the players. The Brite-Court systems address all of these issues and more, We often see local lighting companies, non-sports related lighting companies or electricians install an off the shelf industrial lighting system with none of the above components considered or designed. Lighting technology as well as the placement of fixtures has likely changed since your old existing system was installed. Energy savings is great as long as the lighting system is an improvement to your facility and not a detriment to your players. Retrofit or renovation of your existing sports lighting. Lighting for new tennis court construction. Single or multi-sport lighting systems and design. Consulting and/or lighting products to maximize energy reduction. Lighting design to improve your light quality. Copyright © 2013 - Alternative LED LLC - All rights reserved.